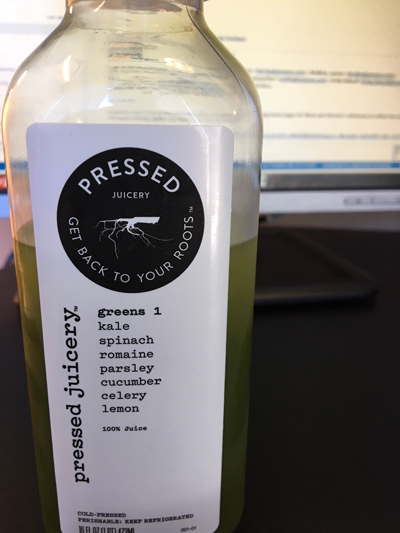 I've done two rounds of juice cleansing via Pressed Juicery. The first was a 5 day "level 2" cleanse and the second was a 3 day "level 3" cleanse. Level 3 was for the most serious cleansers and wow- I don't know that I could have gone a full five days. Anyway, when we were at Stanford last week we stopped into an "in real life" Pressed Juicery! I picked up a day's worth of Level 3 cleanse and drank them today along with a giant plate of roast, potatoes, rolls, and butter......so I imagine it wasn't super effective. Puppy came to work with me today (Ariat is dog friendly) and we scooted out a hair early to head to Puppy Social. Yes- a room full of playing puppies. We've been trying to stay on top of Pep's socialization and go to these things twice a week in addition to a day of training. Unfortunately tonight ended up cancelled due to the Easter weekend (silly me for not double checking the schedule) but we made the most of arriving home early and went to the park with Paul and practiced our "with me" leash skills (Paul calls me a human treat dispenser). I’m going to try a “master cleanse “ - you’ve inspired me!